Pilchard's had some vomiting problems of late. Once a week, for the last three weeks, she's thrown up a rather large hairball. I comb her a couple times a week, but when it happened a third time, I started to worry that she might have something else going on. Off to the vet we went. I need to get a better cat carrier. There are a lot of choices out there which would be much easier to transport than the hard sided carrier I have. I'm getting rid of the one I've had for nearly 30 years. The clasp on the door doesn't hold anymore. If the cat is docile and just goes into the carrier and sits, it's fine. But Pilchard tries to force the door so it doesn't hold. She's down .9 of a pound since our March visit. 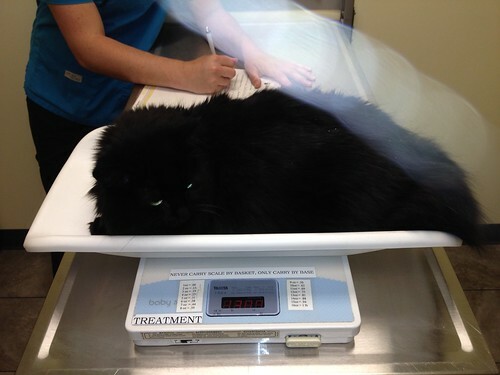 That does not bother me as she tops the scale at 13.1 pounds. She's always been a bit chunky, but could stand to lose a couple pounds. After blood work to rule out any underlying problems, it seems the problem is not being able to get rid of hair she ingests while grooming. I have to add a can of wet food to meals now and laxative paste as much as I can. Dr. Cody wants her to have 2 inches per day, but I'm going to be lucky to get a quarter of that. The stuff I have is 'chicken flavor'. Neither girl was impressed with it. If she continues to vomit hair, there may be a mass in her stomach, which was tender on one side, that will need surgery to remove. Let's hope it doesn't get to that point. I can't imagine the hissing and spitting and growling I'll have to deal with after bringing her home from that kind of appointment. There was enough anger Thursday and Friday to last me the rest of the year. The stress of going to the doctor can cause cats to shed. Pilchard sheds a lot anyway but there was this mass on my pants. 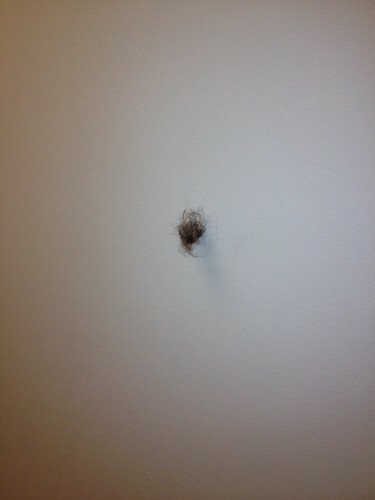 It stuck, perfectly, to the wall. So far, they are doing well with no issues.